System installs on the main water line entering the home. For large commercial and residential complexes, water management software is available on a computer dashboard for management, monitoring, and relevant action. Individual monitoring and control for single family home users or tenants is available on a mobile app. Once installed the system goes into self-calibration mode. It uses SAYA algorithms to create a unique water signature for your home. The SAYA System detect and prevents catastrophic leaks using our water sensor pods, smart control meter a smart gateway and propriety algorithms. SAYA is the only effective system available today that can detect and prevent catastrophic leaks, damages caused by frozen pipes and manage consumption. 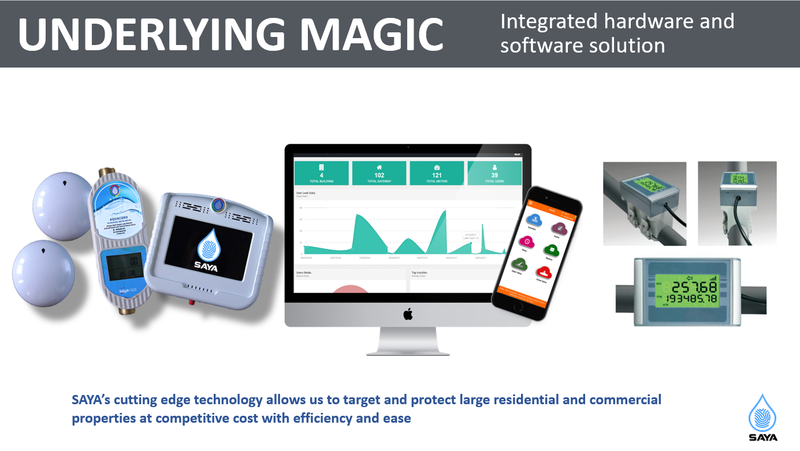 • Allowing users to manage water consumption within their homes by measuring and providing smart water flow reports. SAYA PROPERTY MANAGEMENT kit includes water detecting sensors (for appliance leaks) , a smart control meter ( monitoring and /or remote shutoff capability) and a wireless gateway that can send analytics data to a dashboard. The system gives property managers/ owners complete control of their building. They can proactively manage consumption and mitigate water related issues. Most systems will qualify for Utility and Insurance rebates. Did you know how residential water rates are calculated? Property Owner can remotely manage the system and program the system to automatically shut off the water in case of a critical event. I am very happy to be part of the beta program for SAYA. The product is absolutely amazing. I am able to monitor my water consumptions and get notified on potential leaks. Last week I discovered that my toilet was running. I got the notification and promptly fixed it. I endorse it for everyone. I have one installed at my home in the mountains. I feel safe now with the thought that in case of a leak or frozen pipe in winter I will get notified and can shut off the pipe. Great innovation..
Last time I went on vacation I got back to a damaged home. My water pipe burst and there was water every where … It was a nightmare and it cost me $5000 in deductible and overall cost of repairs was @$40000. I have installed this product as part of their beta program and I cannot be happier. I have control of my home can manage my water from anywhere..
What Is SAYA Smart Water Management ? The SAYA system come packaged with water detecting flood sensors, a smart meter fitted with ultrasonic flow sensors, a pressure sensor, a temperature sensor and remote shutoff valve. The system sends sensor data to the SAYAOne cloud and based on analytics data water alerts like leak events etc are reported on a dashboard or a mobile app. For flood sensor leaks, the valve is automatically shut off. The system can be easily installed at residential, commercial and industrial locations. Where would you install this system? The SAYA system is installed in-line to the main water line ( outside the home or in the garage) before it enters the water heater in the home,It is installed downstream of the utility water meter, irrigation lines and any automatic fire of sprinkler systems. What type of pipe size is supported ? Saya Clamp-on meters can support 3/4″, 1″, 2″ 3″ and 6″ pipes. How many sensors are required in a typical home? Only one SAYA Aquacero Sensor is required to monitor and control water leaks in your entire home. What are the different types of Saya Water Management Systems ? SAYA system comes in two different models. SAYA Smart Management A ( with In-line meters) are installed by cutting the water main line at the entry point of the facility. Saya Smart Management B ( with Clamp-on meters) are non intrusively clamped on the main water pile at the entry point of the facility.